The pharmaceutical industry is under severe pressure due to complex supply chains that are underutilized, inefficient, and ill-equipped to cope with the sort of products. The pharma supply chain must meet the demands of a fast-evolving marketplace and the shift from patient to an outcome to undergo a radical overhaul. Research and development (R&D) costs in the pharma industry are spiraling, development timelines are growing, and consumers are becoming increasingly knowledgeable about care options including drugs and treatment. The marketplace is fixed through the development cycle and increasing efficiency through rationalization or outsourcing of non-core activities. Recently, the pharma industry moved from the “one-size-fits-all” approach for the supply chain flexibility, responsiveness, and reliability. This chapter enables readers to understand the techniques for rapid commission and decommission new products and markets and alternate supply models, inventory tracking tools to eliminate counterfeiting and parallel-importing risks. In earlier years, the pharmaceutical industry is one of the most successful industries with various disciplines including research and development, production, sales and marketing (Amegashie-Viglo et al., 2014). Both sales and profits have been increased by continuing the top safety and quality standards in the pharmaceutical industries (Nakov et al., 2014; de Vries & Huijsman, 2011). However, nowadays, the pharma companies are facing more challenge made by an aging population, the increasing cost of healthcare, pressure from governments to reduce the price of drugs, barriers to entry in emerging markets and the wider adoption of generic drugs. Patients are demanding further personalized care over a multitude of various touch points. The modest intensity has improved with a rapid growth of generics. For the new market, the product portfolio has become more difficult with many niche products. Large drugstore chains for the over-the-counter products are commanding the high standards just like the consumer product companies. The increase of counterfeited drugs and the serialisation and quality regulation are imposing pharma companies to form their supply chains more strong to confirm full traceability (Abdallah, 2013). Therefore, the effective pharmaceutical supply chain management is extremely important to protect against these challenges successfully. The effective supply chain supplies drugs in the exact quantity and to consumers with the right quantity, with finest prices and at the correct time to provide profits for every stakeholder (Jaberidoost et al., 2015; Shou, 2013). The pharmaceutical supply chain is a major component of health organization including all procedures, data, resources, suppliers, manufacturers, intermediaries, third party service providers, merchandising and sales activity, logistics activities, financial and information technology. The application of supply chain management (SCM) systems in pharmaceutical companies is proposed towards rationalization the process of planning, production, distribution and storage of the final product before it comes to its final customer/user (Stadtler, 2004). The process of rationalization, via the introduction of standard SCM modules and systems in the pharmaceutical companies, then again permits reducing the cost of the final product, thus increasing its competitiveness compared to other related products formed by the competitive pharmaceutical companies. The main objective of this chapter is to study the challenges and their best practices in pharmaceutical supply chain management in the pharma industry. . 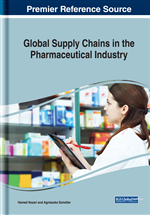 The supply chain practices mentioned in this chapter can be used to maximize the revenue from the pharma products and industries can adopt themselves in the rapidly growing market price. The supply chain can be a best added value to the developing pharma industries. Network: It is the process of developing a mutually valuable relationship with other business people and potential clients and/or customers. Pharmaceutical: A compound, which is manufactured for use as a medicinal drug. CMOS: A contract manufacturing organization (CMO) is a company that provides other companies in the pharmaceutical industry on a contract basis to offer comprehensive services from drug growth during drug manufacturing. Supply Chain: It is a scheme of organizations, people, information, activities, and resources in the process of transferring a product or service from supplier to customer. Product Design: It is basically the efficient and effective creation and development of ideas all the way through a process that directs to new products. Demand: It is a multifaceted arrangement of push- and pull-driven demand and regulatory and pricing pressures. Drug Manufacturing: It is the process of industrial-scale production of pharmaceutical drugs in pharmaceutical companies. Packaging: It can be defined as the economical way of providing presentation, protection, identification, information, convenience, compliance, integrity, and stability of the product.